Have a question on Passat? Passat is available in 4 different colors - White, Red, Silver and Blue. Watch latest video reviews of Volkswagen Passat to know about its interiors, exteriors, performance, mileage and more. This significant family car by Volkswagen is large in its dimensions due to which it became prominent German manufactures take in the segment. Launched in its first variant in 1973, Volkswagen Passat has now traversed a long successful journey over years. In the current line-up of the brand, Passat is positioned between Volkswagen Jetta and Volkswagen Phaeton. 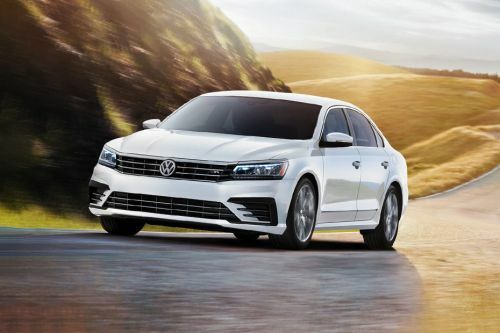 Although looking at its predecessor, current generation Passat has gone through few cosmic changes and these crispier lines added to its profile are worth eulogizing. Leaving home besides won't make you feel wistful, Volkswagen Passat endeavor each and every aspect which makes your journey blissful and in-supreme comfort. Passat is lined inside with 'Vienna' leather seating with 'Alcantra' with dashboard elegance highlighted in wooden and black inserts. Dual-zone climatronic air conditioning system allows you to set dual zone temperature as per the desired need. 529-litres of boot space is provided along with other mini storage compartments making hauling-up of cargo easy. Due to its stretched wheelbase, the passengers in rear cabin has space more than a saloon offers. Sunroof allows easy entry of sun hues to the cabin with its tilting, sliding and tinted function. Fender premium audio system with nine-speaker surround system, MEDIA-IN with iPod/iPhone interface, Bluetooth connectivity makes it easy to connect with devices and phone. In addition, to direct you to right places, premium touchscreen with navigation feature is provided. Volkswagen Passat has a completely redefined exterior structure with sleek and confident highlights added to its profile. Looking at the front facade, you can instantly relate to the Volkswagen style staging the grille and brand's marque right in place. Increasing the elegance, headlamps are placed at the corners with illuminating fog lights on the bumper that assists you in driving easily. Sweeping rear windscreen flecks small shark-like fin tail on the top facilitating the high speed runs. The overall dimensions of the car is measured as 4868mm x 1835mm x 1487mm (L x W x H) along with the wheelbase of 2803mm. 16 to 18 inch alloy wheels comes fitted in this car with 16-inch wheel of tyre size 215/44 R16. This large family car is available in four trim levels – S, SE, SEL and Sport. All the variants are equipped in 2.5-litre, in-lined five cylinder that generates maximum power output of 170 bhp along with the peak torque of 200 Nm. Mated with six-speed automatic transmission, this car can cover 0 to 100 kmph mark on speedometer in 9.2 seconds. The top speed of the vehicle is counted as 190 kmph. You can expect this car to deliver impressive fuel efficiency steering in standard driving layout. Driving in city you will get the mileage of 13.2 litres/100km and on highway runs you can cover the same distance taking 9.4 litres of fuel. Safety comes first whichever vehicle you travel in. That's what Volkswagen Passat takes care of in true sense with its Intelligent Crash Response System due to which you can fasten the unlocking process of doors, turn off power to the fuel pump and switch on the hazard lights in event of collision. 6 standard airbag system including driver, front passenger, curtain for front & rear, side front airbag is there that will help you reducing the accidental hazard. With the four corner independent suspension, anti lock braking system and hydraulic brake assist vehicle will remain in control assisting you in applying maximum brake pressure when needed. Moreover, Electronic Stability Program (ESP) keeps check on your steering technique and handles the vehicle effectively in extreme conditions. Other safety aspects laden in this car includes immobilizer, tire pressure monitoring system, rear view camera, windshield wipers and more. This sensible, sophisticated, sleek family car by Volkswagen is a good take. Enough legroom for the rear occupants and is also good on styling. Economical price range of its rivals may become a problem for it. What is the price of Volkswagen Passat? On road prices of Volkswagen Passat in starts from AED96,500 for base variant S, while the top spec variant Sport costs at AED131,000 . What are the colors options available in Volkswagen Passat?